Black Bean Brownie brings together two worlds that usually do not get to co-exists, decadent and healthy! Breads from Anna uses an all-natural cocoa and sweeten with a little honey. You add a can of black beans, some milk or your favorite non-dairy drink, 1/3 cup butter or oil (one egg and nuts are optional). 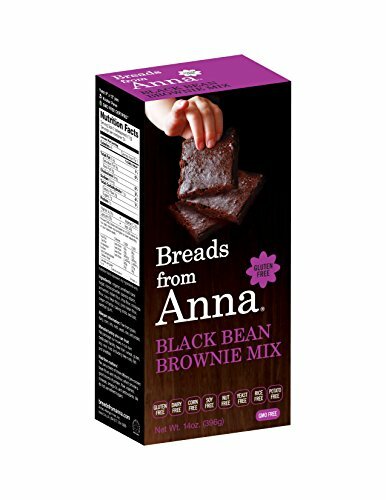 This bag of mix will make a 9x13 pan of brownies that will fill you up faster (lots of protein and fiber) and give you that great feeling of satisfying a chocolate craving. These brownies are also great for your friends and family who are diabetic, because of the amount of protein and fiber blood sugar levels will not spike. View More In Baking Mixes. If you have any questions about this product by Breads From Anna, contact us by completing and submitting the form below. If you are looking for a specif part number, please include it with your message.